I will just go ahead and address the giant elephant in the room. I confess that I have not blogged in, like, four months. I very much look forward to getting back into this blog once after the wedding. Well, let’s be honest, probably more like after the honeymoon. But I miss this so much and I am looking forward to having the time to devote to this blog again! That being said… our wedding week is here! I remember when I first started planning after we got engaged almost 14 months ago that I wish that the time would just fly by. Well, I got what I wished for. Now everything I have been working so hard for will be coming together in less than a week. I have such a long list of little things to do that I am just hoping this all goes off without a hitch. Well, maybe one hitch… the *getting hitched* part! We are leaving for our honeymoon the following weekend after our wedding. We are going to do nothing on a beach for 9 days at the Excellence Playa Mujeres Resort in Mexico. I. Can’t. Wait. Anyhoo, I spent the Saturday evening before my wedding attempting to create a bouquet for our rehearsal out of the ribbons from the gifts we have been so fortunate to receive. I tried consulting Google and Pinterest first to no avail. There was no tutorial that explained how I am supposed to create a bouquet from primarily Crate and Barrel and Bed Bath & Beyond ribbons. The only piece of advice I took away is that I either needed to use a floral styrofoam thing or a paper plate. After a frustrating few laps around Hob Lob for ideas, I walked out with the styrofoam and extra floral pins. I thought I would just open a bottle of wine, put on some College Football, light a fall-scented candle, and wing it. I now felt very overwhelmed that I was going to attempt to do this. Additionally, I was very overwhelmed that I was going to have to go through with it because I was determined to post about it on the blog. I took a deep breath and a deep swig and dove in! I decided that I would use the purple Bed Bath and Beyond ribbons first to go all the way around the widest part of the styrofoam. They all had bows and were still looped from being slid off of the gifts. I pinned the bow to the edge with a floral pin. Since this styrofoam wasn’t wrapped and I didn’t want it peeking through all the ribbon, I attempted to wrap it with the rest of the material from the bow. This picture shows me wrapping it and trying to figure out what to do with the excess. I ended up cutting the middle of the loop and wrapping it around the styrofoam for the remainder of the purple bows. This way the excess could stretch out a little longer. This styrofoam sheds what may as well just be glitter. It gets EVERYWHERE. I was concerned that I was going to have a green sand ribbon-covered bouquet. The green styrofoam is the worst! The next few photos are the evolution of the purple ribbon bow perimeter. Makes for a pretty nice hat, yeah? After the purple bow portion was done, I sloppily affixed the jewel thing to the middle of this bow with hot glue. It is way too heavy for the bow, but I kind of made it work even though it flops around and is completely crooked. I then pinned it to the middle of the styrofoam. Next, I began making the Crate and Barrel ribbon flowers. The ribbons I cut were about 7 Crate and Barrels long. 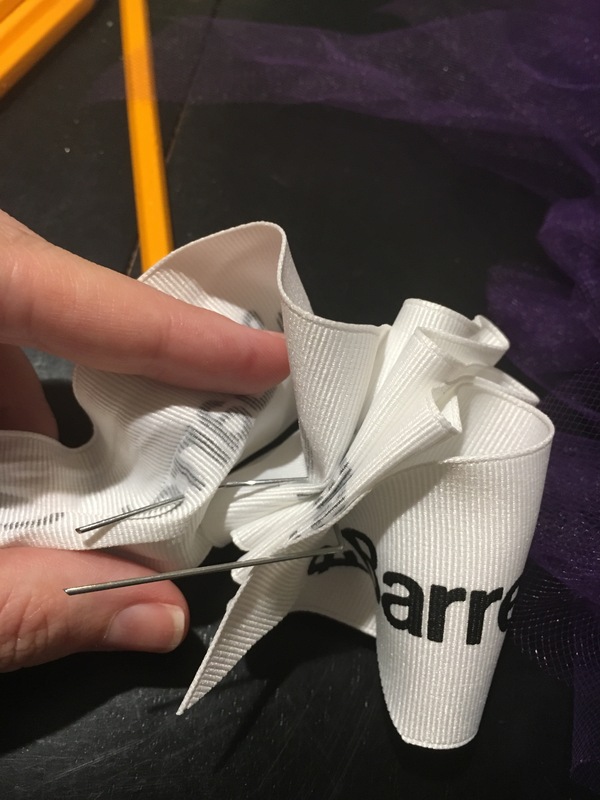 I took a floral pin and began looping the ribbon onto it. I continued until it somewhat resembled a flower? A WARNING TO ALL: Floral pins are sharper than they appear. You know when people say that their blood, sweat, and tears went into something? Well, there were no sweat or tears, but some of this ribbon for sure has blood stains on it now. It was made with love. Pro Tip: Do not try to shove the pin through the black printing. Find a white space. I pinned the “flowers” in the space between the purple bows and the big bow and continued until I made it the entire way around. The next step was to attempt to make a handle. Part of my Hob Lob frustration was that I couldn’t find anything to make a handle out of that wouldn’t be a total waste of the rest of the product (Ex. : a $3.99 bag of sticks). My fiancé had some pencils lying around in a pencil cup from his college days, so I decided this would be sufficient. I secured them in a handle-like shape with a clear elastic. Who says hair products can’t come in handy? I placed a glob of glue on the pencils to affix the ribbon. I did not do the greatest job of wrapping the ribbon all the way up, but hopefully I made up for it by wrapping a shinier ribbon on top of it. I used hot glue to secure it at the top, as well. I decided to level the eraser end so the sharp ends would have varying levels of pointiness to better secure themselves into the styrofoam. I then decided that the handle needed a pretty bow. I went to shove the handle into the styrofoam and quickly realized that in my excessive ribbon wrapping, I didn’t leave any space for the handle. I removed a few floral pins and cut away a bald spot with the scissors. As it turns out, the “pointiness” of the pencils would not be enough to secure it into the styrofoam. I squeezed a hefty amount of hot clue into the hole I had created during my initial effort and stuck the pencils back in there. It seemed to hold the pencils much better. Prepare to never be able to use these pencils again. It is hard to get a picture of the final product since it is both ginormous and impossible to get a photo of both the top of the bouquet and the handle. But anyway, here is the finished product! The entire project took me about an hour and a half. It was not nearly as difficult or traumatic as I expected it to be. The most important thing that should be taken away from this is that wine is the secret ingredient to most crafting projects. Thanks for stopping by! See y’all next time..